All transactions are safe and secure with a reliable history in online purchasing behind each of our associates. 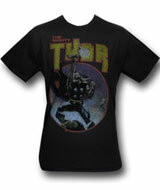 Buy The Mighty Thor Distressed shirt to own Thor clothing and merchandise. The distressed Mighty Thor t-shirt design is best for people who have been fans for years and want to show it with a vintage look. His powerful pose shows that he can take on anyone at any time, as long as he has his trusty Mjolnir weapon. Of course, being able to summon nature's powers doesn't hurt either. Shake up your world with this item and a prop Mjolnir hammer. In addition to The Mighty Thor Distressed tee above, browse the Thor Clothing Gallery for more apparel like men's and women's clothes, kids shirts or hoodies.